Hurray for Emil’s 50th birthday! Emil in Lönneberga is 50 on 23 May. We are celebrating his birthday with a new woodshed and figures of Emil and Ida that the children can play with! Emil’s birthday will be celebrated in several ways during the year, including the premiere of a new animated Emil film at cinemas. 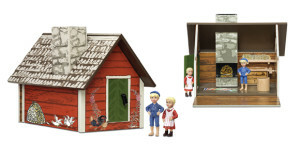 It goes without saying that at Micki we want to celebrate the boy from Katthult in the best way we can, and this year’s new products therefore include a completely new woodshed and figures of Emil and Ida to play with. Naturally, you can play with the figures both inside and outside the house, the roof can be lifted off making it easy for the children to access. Inside Emil’s woodshed is both a carpenter’s bench and a chopping-block. Emil’s woodshed and the Emil and Ida figures will be available in shops in the autumn. However, if you visit Astrid Lindgren’s World you can purchase Emil’s woodshed as early as the summer! Emil’s woodshed and the Emil and Ida figures are some of this year’s new features from Micki Leksaker. Here at Micki we’ve always loved Emil, so our Emil shelves are already well-stocked for all children who like the mischievous boy from Lönneberga. These favourites are available in store now. Emil products in our range. 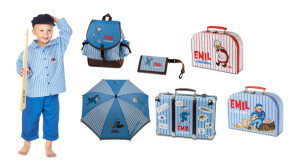 Have a closer look at our Emil products!